Sharon H. Chang is an author activist who focuses on exploring racism, social justice and the Asian American diaspora through a feminist lens. 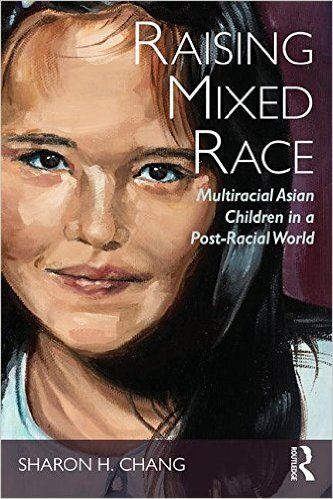 Her new book, Raising Mixed Race: Multiracial Asian Children In a Post-Racial World, was just released from Routledge Publishing/Taylor and Francis Group. The book explores the marginalization of mixed-race people and how to support mixed-race children in developing their own identities. Chang earned two bachelor’s degrees from UCLA and a master’s degree in human development from Pacific Oaks College. She worked with young children and families for over a decade as a teacher, administrator, advocate and parent educator. Recently named The Seattle Globalist’s 2015 Social Justice Commentator of the Year, Chang’s writing has also appeared in BuzzFeed, ThinkProgress, AAPI Voices and even ParentMap. She is a mom to a school-age son. We had our son [who comes from two mixed-race Asian/white parents] in 2009. All of sudden I looked at this small new mixed person, my heart and soul, and I thought: I have no answers for you — answers to questions I know you'll have because I've had them my entire life. So I set out to find anything — research, literature, parenting books, kids books, toys — that would reflect our family and help us deepen our understanding. And I found practically nothing. Which was saddening, devastating and infuriating. In society's eyes, after all these decades, people like my family still barely exist and if we do exist, we can't possibly have racial experiences that are worth exploring beyond post-racial fetishizing. That was when I decided to pick up my pen and paper, go out into the field, and start interviewing for what became the book. What’s one thing parents should keep in mind when raising mixed-race kids? One of the most disturbing things I witnessed while interviewing parents for this book was high levels of indoctrination into white-dominant thinking [by both white parents and parents of color]. In particular, parents avoiding examining their own racial identities, downplaying the impact of racism on their families, refusing to name the real problem of white supremacy, and buying into the illogical belief that the birth of mixed-race children alone will erase all of society's racial problems. Here is the certain truth: We absolutely will not be able to practice antiracist parenting if we can't confront our own denial and miseducation first. Here is the certain truth: We absolutely will not be able to practice antiracist parenting if we can't confront our own denial and miseducation first. What barriers do multiracial Asian children face in identity formation? First, based on how the children scan racially, they will often be subject to monoracial stereotyping and discrimination. For instance, if a child is mixed Asian/white but "looks" Asian enough to others, they typically endure anti-Asian oppression at some or various points in their life. If a child is mixed black/Asian but "looks" black to others, they will obviously endure anti-black oppression at some or various points in their life. But on top of these pieces multiracial Asian children face added barriers very specific to their mixedness. One of the largest being compounded invisibility where they are devastatingly invisible to the public not only because they are children, but because they are mixed-race and Asian (all three populations are highly ignored by mainstream society). Mixed-race children are some of the least likely to see themselves reflected in their learning environments and learning materials or to have adults in their lives who even notice this lack of reflection. Multiracial Asian children are very likely to live in racial isolation where they have very little contact or exposure to others like them. And lastly, multiracial Asian children often contend with very high degrees of parent indoctrination, where parents have an underdeveloped political self-awareness and are ill-equipped to deal with race alone, much less mixed race. How can parents and educators support multiracial children in their journey to combat 'racially minimizing' comments and understand their unique identities? Read, watch, witness as much work as you can by and about multiracials (be very careful about materials that are about multiracials but by monoracials). Give mixed children as much access to those same materials as you can. Open the door for ongoing conversations. Very often mixed-race people are silenced by being messaged in covert [and] overt ways that their identities are invalid, [that] experiences of race [are] unimportant, and [that] they should not speak. Acknowledge that mixed-race children and mixed-race people need affirmation [and] space to talk about who they are, [and that they] have their own hurtful racializing experiences and need opportunities to process and heal from those experiences with you but especially with other mixed-race folk.